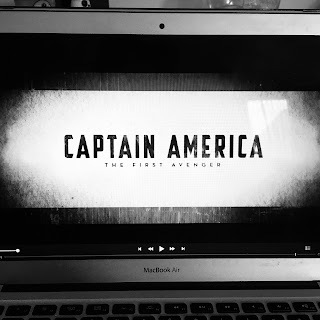 I never thought I'd warm up to Captain America. Before I watched his trilogy, I passed him off as Marvel's equivalent of Superman - a character that could never do wrong or lose a fight, and who was just a bit bland. But the first time I watched this film last year, I was surprised by how much I enjoyed it, and watching it again to write this post has reaffirmed my fondness for it. Steve Rogers isn't a two-dimensional hero who only punches bad guys and saves the world (although he certainly does do those things). He's just a kid from Brooklyn who is given the opportunity to fight for his country, and finds himself in the spotlight as a symbol of hope and strength. In many ways, he's your typical hero - courageous, strong, morally correct, almost faultless - but behind the Captain America mask, he's also still the scrawny little man who is still carrying around his old insecurities. He's also surprisingly good with the quips - I found myself laughing at some of his one-liners, which I wasn't expecting from a more serious character in a more sombre film. Comparing the romance in Captain America to the one in Thor makes the latter seem laughably lame. Steve and Agent Carter's relationship is inevitable, but it's gradual and builds up over a long period of time, to the point where their final words to each other are truly heartbreaking. And while we're on the subject of Agent Carter, can I just mention how awesome she is? As much as I hate to use the phrase 'strong female character', she fits the mould effortlessly. She's fierce and no-nonsense, but also passionate, hence why she shoots a gun at Steve after she catches him making out with another woman. She acts as more than just a love interest. She is Steve's companion and mentor, and it's a relationship that you root for. The final scene. I remember it catching me totally off guard the first time I saw it, and even though I was expecting it this time around, I still felt the tension while Steve was asking where he really was. 'Stan twitter' is right to be so obsessed with Steve and Bucky's friendship. Because I know everything that happens to them after this film, I'm preparing for heartbreak as I continue with this marathon. Even seeing their interactions in this made me remember the ending of Infinity War, and I just had to groan in pain. The scene in the bar, specifically the moment that Peggy turns up in the red dress, and throughout her interaction with Steve, she stands out so vividly against the dim brown set and the outfits of those around her. Just a nice detail that I appreciated. I'm going to put it here on my ranking for now. Although Thor is the film that I would rather re-watch because of its silly humour and fantasy aesthetic, there's no denying that Captain America: The First Avenger is the better film.